These Formula 602s are ideal for jazz, unplugged sessions, laid-back pop or any music which begs for subtlety - for these genres, and indeed for recording, they tick all the boxes. Authentic spec and build quality. Wonderfully playable. Acceptable - but not great - value for money. That Paiste would ever have contemplated ending production of their Formula 602 cymbals now seems inconceivable, but, in 1989, that is exactly what they did. After a run of over 30 years the coveted series came to a close. Fortunately, 2010 saw the re-introduction of the 602s - a series deeply entwined in the history of many a drumming legend. Initially, the selection was limited, but due to an overwhelming demand, the Swiss-based cymbalsmiths are creating more and more new Formula 602s. "Each of these new models are made to replicate the shape, finish and ultimately the sound of the original 602s"
For review we have a pair of 15" Medium hi-hats, a 16" Paper-Thin crash and a sizeable 24" Medium ride. Each of these new models are made to replicate the shape, finish and ultimately the sound of the original 602s - they are created from 'masters', which apparently were "dusted off" and used as templates in order to accurately reproduce each cymbal. They are entirely hand-made using the same manufacturing methods, materials (cymbal bronze alloy CuSn20), and even the design of the logos from the models made in the late 1950s. A sideward swipe across the edge of the crash causes it to rise rapidly, immediately tailing-off with a subtle shimmer. When choked, it halts immediately, without the after-ring evident on the crash of the Black Alphas reviewed last month. 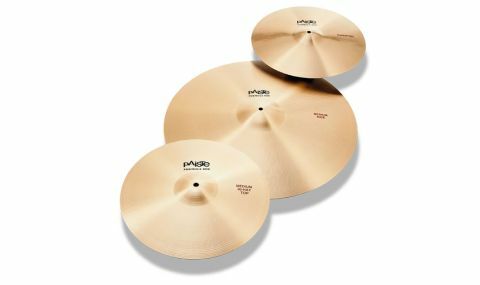 "The hi-hats have a crispness about them which is cutting, but not overpowering"
This could be perfect for jazz but is too light and wispy for anything like hard rock, offering little resistance to a pair of fat sticks! The hi-hats have a crispness about them which is cutting, but not overpowering. Half-open they sizzle effortlessly away, intertwining with any passage of music with warmth and restraint. The top hi-hat could easily double as a crash with a rapid attack and the now-familiar shimmering sustain. This, of course, is chopped as soon as the foot lands on the hi-hat pedal with a tasty 'chick'. We try to resist being captivated by the size and lustre of the ride but, with just a couple of strikes, this giant has me mesmerised. Totally immersed with each slightly more intense strike, the ride smoothly rises, becoming louder and louder and eventually peaking. It remains fully controllable even during the fastest, most intricate stick work. The bell is equally impressive - punctuating not penetrating - just beautiful.